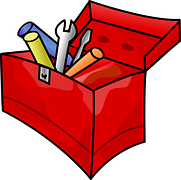 In a Business Toolkit, there is a multitude of tools and applications available for use to an entrepreneur wanting to start or is running a business. Computer Systems, Software, Communication and Presentation Systems. Every Business needs a basic ToolKit. Tools for monitoring your businesses financial standing, tools for marketing, tools for hosting, tools for building a Website, even Websites for free! read our article Internet business without investment Whatever your business there is a tool available that you will likely use to make your business efficient and competitive, a key tool in your business toolkit is a Business Plan. A well executed and operated business always has a plan, planning is the key to business success. You can write a very simple one-page plan including a SWOT Analysis, listing your Strengths, Weaknesses Opposition and Threats. List your Goals and a brief Cost Analysis a basic budget covering your startup cost, overheads and importantly income. You are in business to make a profit, at the end of each day after all expenses are paid “Including You”. You need to have money left over to put in the bank. Money in the bank can build for a rainy day, it’s there for a possible disaster, re-invest to grow and expand your business and of course as a future fund for your lifestyle and retirement. A professionally written plan is the most effective and readily accepted by financial institutions especially if you are wanting to finance your business. Read our review of LivePlan on our review page Online Plan Reviews LivePlan is one of the best Business Planning tools available, the world’s most popular and is user-friendly. Connect with us on a Social Network or Subscribe to our Mailing list to keep up to date with new tools as we make them available.